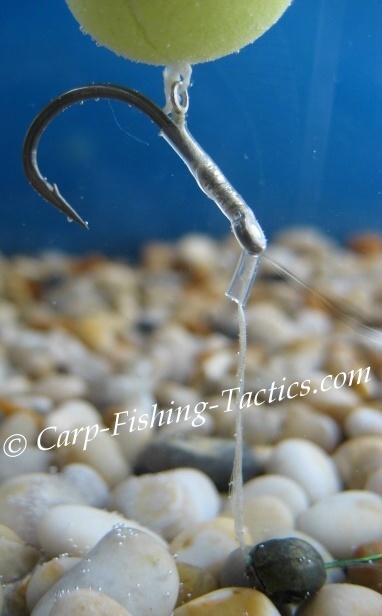 I like to call this fishing rig the "claw carp rig" because the hook is positioned at an angle similar to a claw. I think this position helps the hooking potential when both the rig and bait are taken into the mouth. 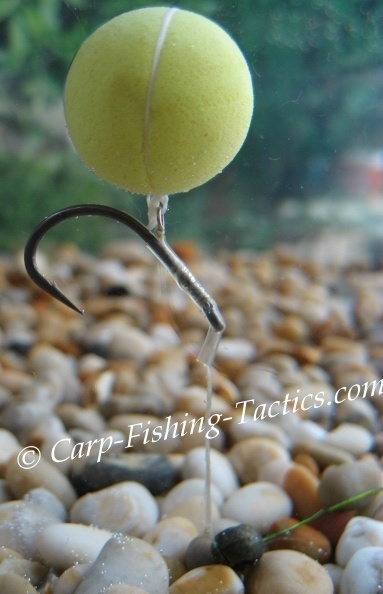 Danny Fairbrass uses this type of carp rig, and I used his idea to illustrate the fishing rig below. This carp fishing rig is best to use with pop ups as they help give the hook that claw position. 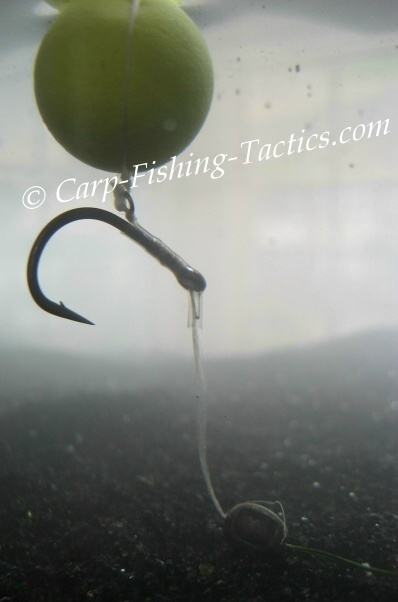 A bottom boilie bait will not allow the rig to work effectively. As you can see this claw rig is presented on gravel bottom, but further below it is presented in silt. I like to pin the coated section of the claw rig on the bottom using a shot weight. The shot can be critically weighted so it just drops gently to the bottom, or in windy conditions, it may be better to weight it down a little heavier so the rig doesn't float and bob around with the undercurrent. For this rig I used snakeskin hooklink material. As the skin is peeled back it exposes fine strands (about 1 inch in length) that make it hard to see in clear water. The skin is left on after the shot so the whole rig can push away from the lead when it lands on the bottom. The claw fishing rig is probably ideal to present on the edge of weed beds, or in between small clumps of weed, or clear weed patches. On gravel it doesn't look natural, but like everything in carp fishing, it can still work on gravel. 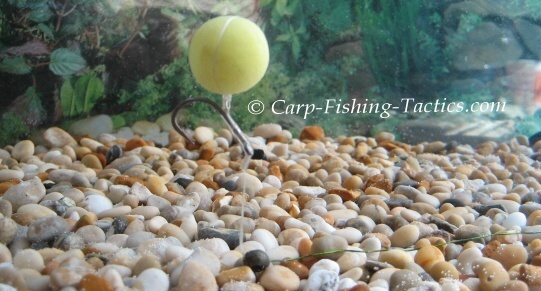 A close up picture of the claw carp fishing rig in water. The rig ring should be positioned opposite the point of the hook. 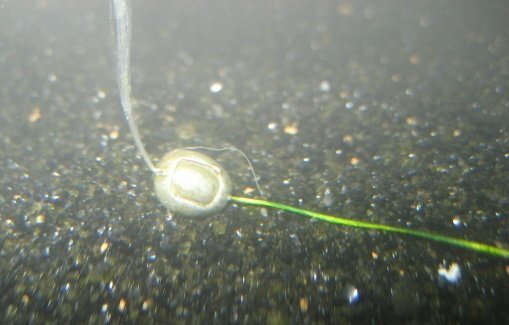 The hook is tied on using a knotless knot, then shrink tube is added leaving a small inward kink after the eye. this allows the hook to turn more effectively so the point can prick the flesh of the mouth. 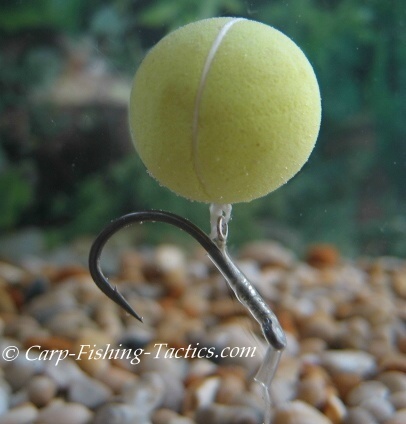 Danny Fairbrass uses this type of carp rig, but I don't think he strips any of the coated section back. This allows the hook bait to push away from the shot rather than going straight up like in mine. I think Danny's rig is probably best as it may not tangle at all. Mine hasn't tangled on me yet, but the loose strands after the shot could cause the hook to swing up and catch the stiff section of the hooklink material. The claw rig doesn't look too bad when presented on a silt bottom. However, I would change the link material and shrink tube to black so it suits the lake bottom. I believe this fishing rig is best when presented in clear patches of weed clumps rather than on silt. On a soft silt bed, a neutral buoyancy fishing rig would be best. 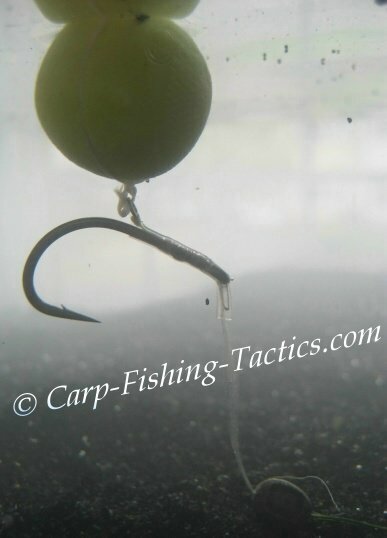 The hook bait would sit nicely on top of the silt, yet still look more natural than the claw rig above. An overview of the claw fishing rig presented on a silt bed. The material used to make this carp fishing rig doesn't match the bottom, we used this just to illustrate the rig in water. When actually fishing, I would change the materials to suit the lake bed I'm fishing on! In silt beds it may be best to used black amnesia for the stiff section of a combi-link fishing rig!.